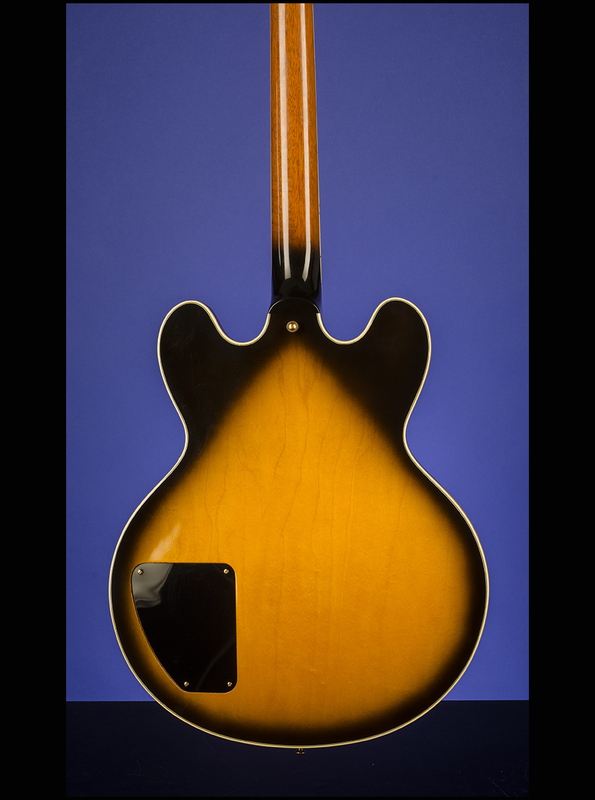 ES-355 TDSV StopTail Guitars | Fretted Americana Inc. 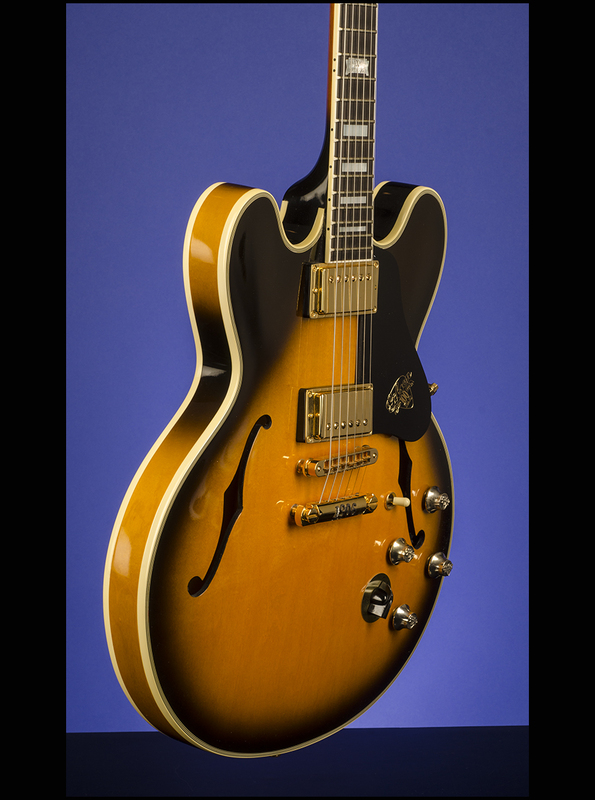 This Centennial ES-355 is [number 8] of the 100 guitars made in 1994 to commemorate Gibson's 100-year anniversary. 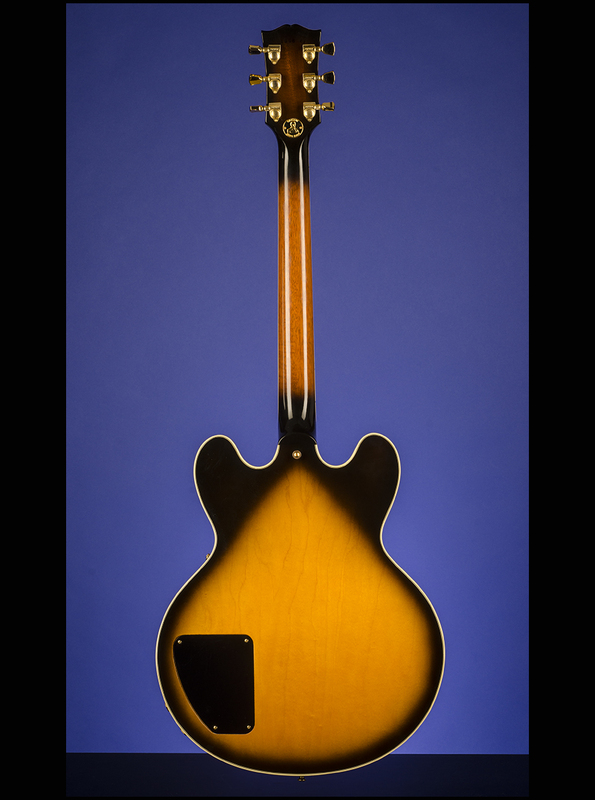 This amazing guitar weighs 9.60 lbs., and has a laminated maple body with a maple central block. The body is multi-bound on the top (seven-ply) and the back (three-ply). One-piece mahogany neck with a nut width of just over 1 11/16 inches, a scale length of 24 3/4 inches and a very fast thin profile. Single-bound ebony fretboard with 22 original medium frets and inlaid pearl block position markers (the twelfth fret with a pearloid banner engraved in black "1894 100th 1994/Anniversary". 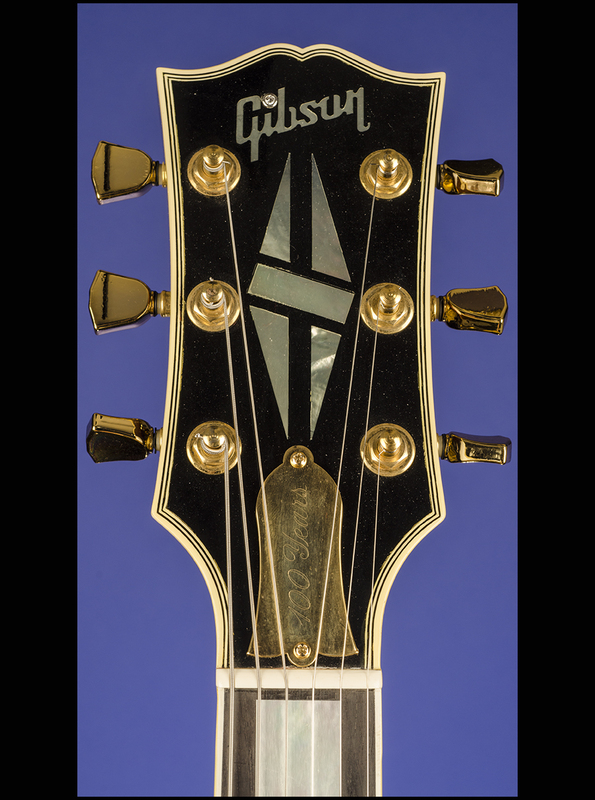 Multi-bound headstock with inlaid pearl "Gibson" logo with 11pt diamond and pearl five-piece split-diamond inlay. 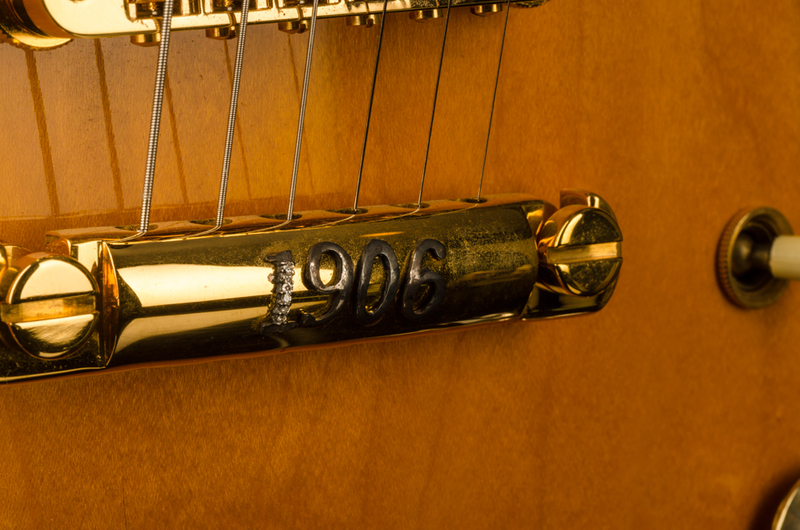 Gold -plated bell-shaped truss-rod cover engraved with "100 Years" and secured by two screws. Individual Grover Roto-Matic tuners with half-moon metal buttons. 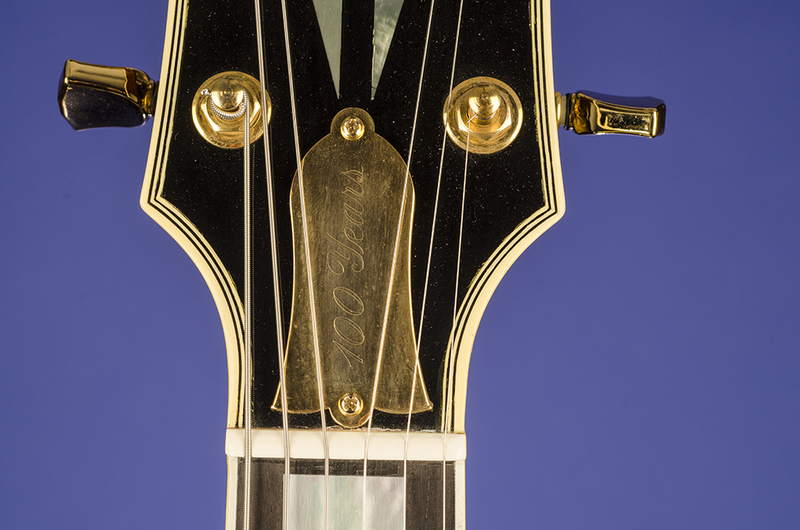 Serial number "1906-8" inked-on in black on back of headstock. 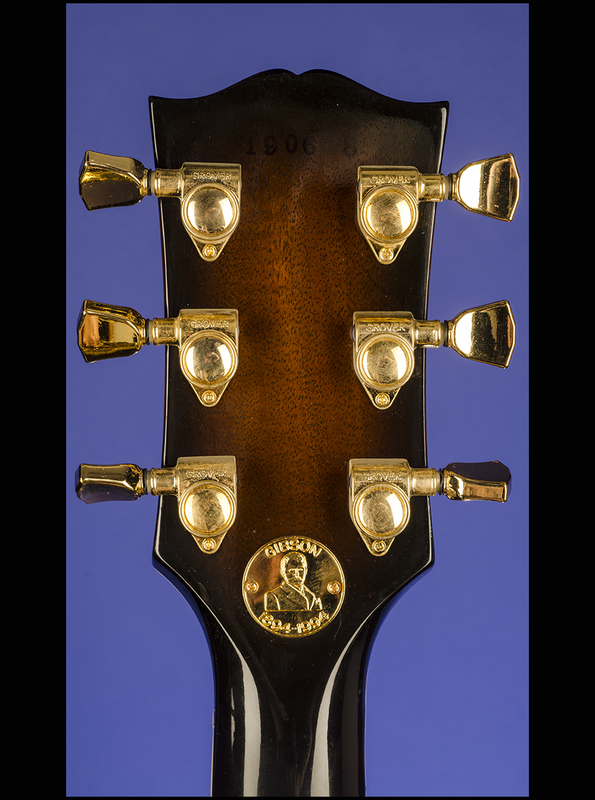 'Centennial' 22k gold-plated anniversary Orville Gibson Coin recessed into back of headstock and secured by two screws. 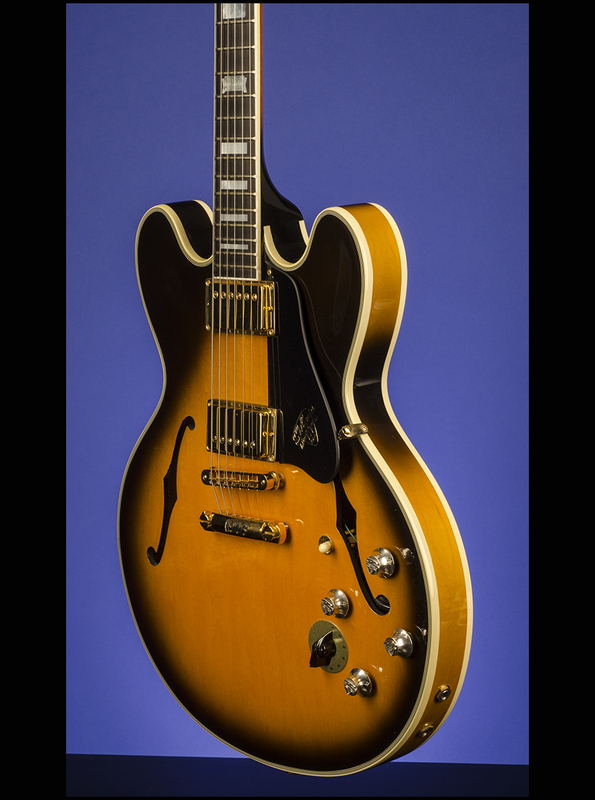 Two Gibson 490R Alnico magnet humbucking pickups with outputs of 7.78k and 7.82k. 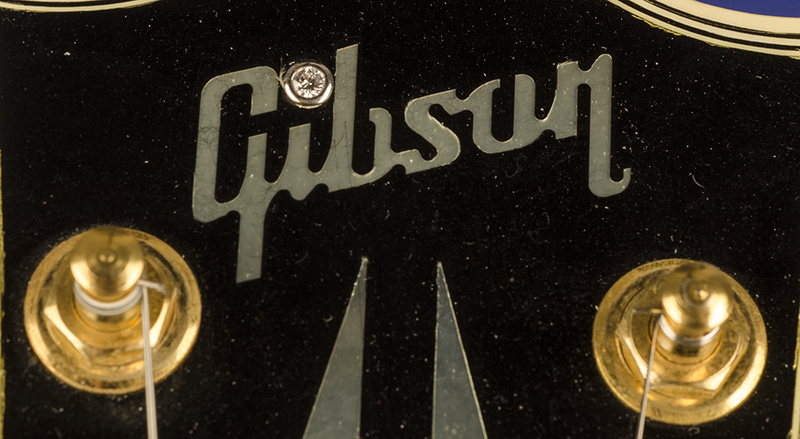 Single-layer black plastic pickguard with "Gibson/1894 100 1994/ Years" stamped in gilt. Four controls (two volume, two tone) plus three-way toggle switch for pickup selection, all on lower treble bout. 22k gold plated 'top-hat' control knobs with embedded 100 Year Anniversary logo and 5pt. diamond. Nashville Tune-O-Matic bridge with metal saddles and 'stud' stop-tail. All hardware gold-plated. White oval label inside bass 'f' hole with serial number "1906-8" written in black ink. Two jack inputs on treble lower edge of body (one regular and one stereo). Apart from a couple of miniscule indentations on the back, this guitar is in mint and unplayed (9.50) condition. 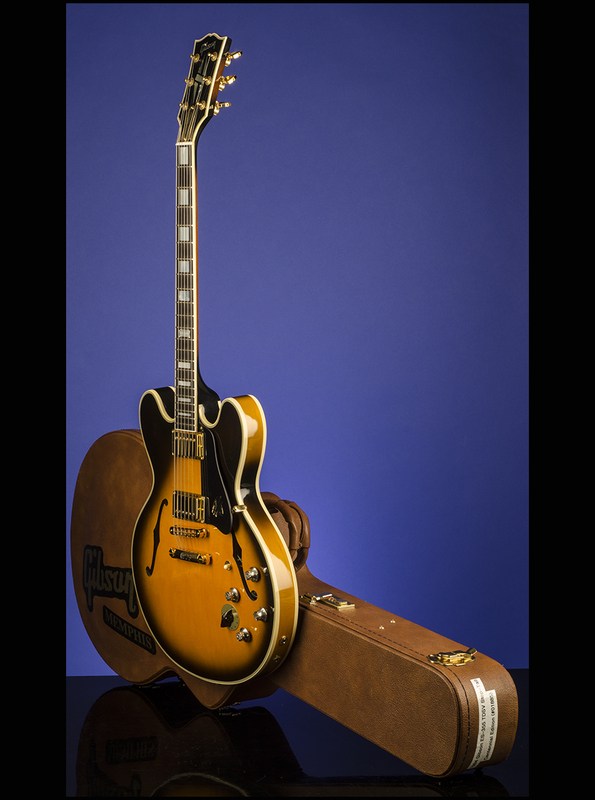 Housed in the original Gibson four-latch, shaped brown Gibson hardshell case with purple plush lining (9.50). 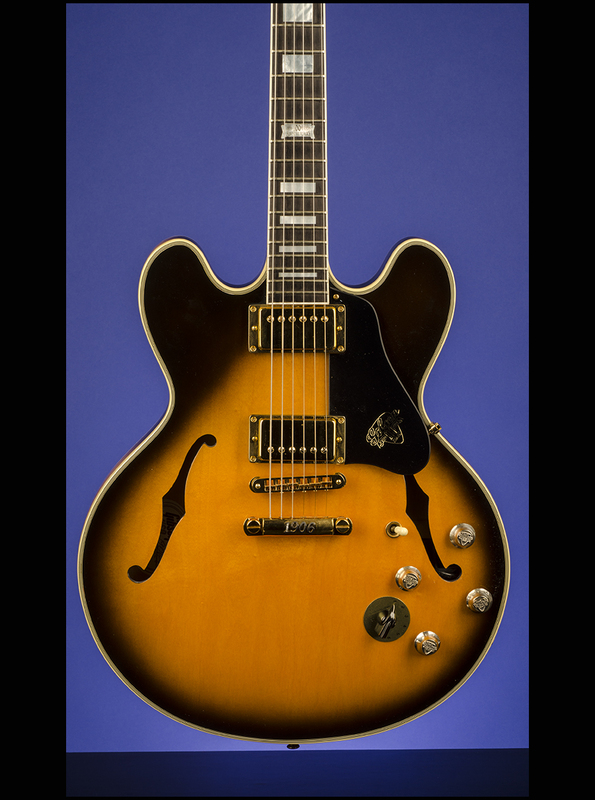 The first ES-355 in this series had the the serial number 1894 - this one has the serial number 1906 which makes it the thirteenth guitar in the run. 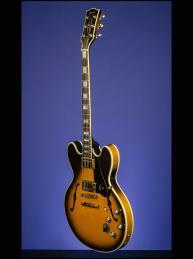 Each month during 1994, one Limited Edition guitar was produced by Gibson. 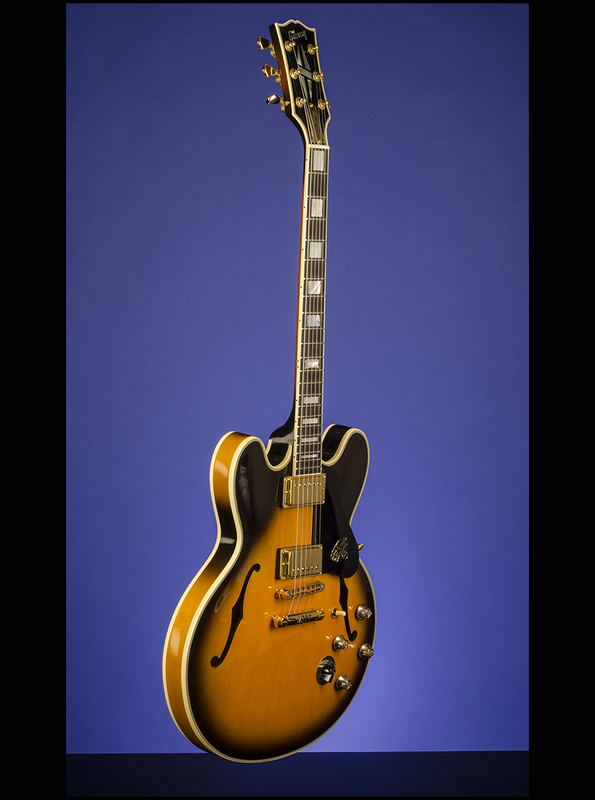 The ES-355 was the guitar for June. 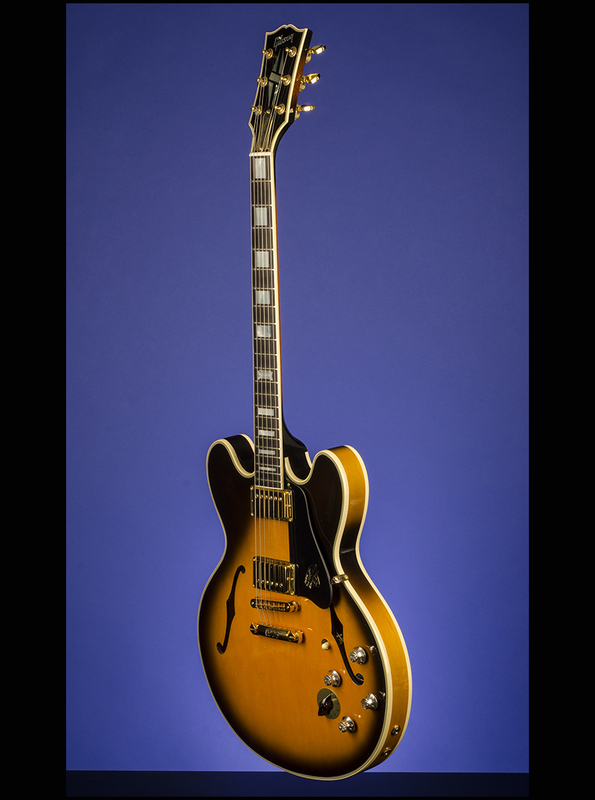 Production was limited to 100 each of these exquisite instruments and each guitar received its own jeweled serial number. 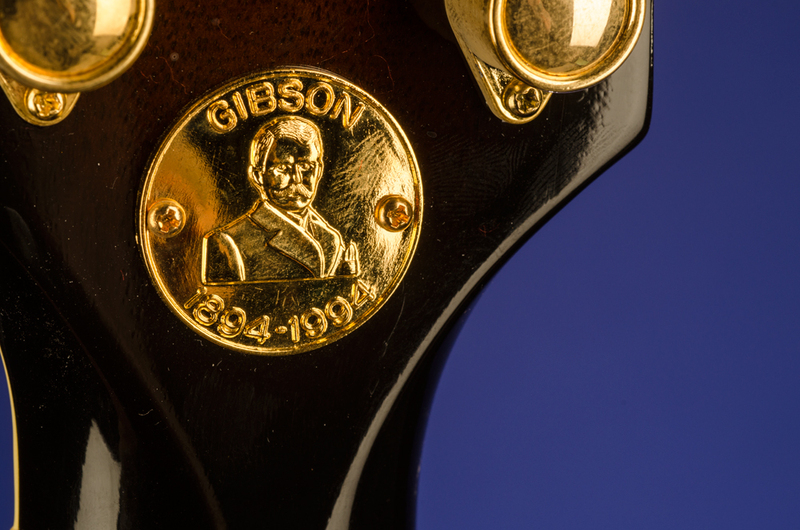 Numbering was sequential from 1894-1994 in celebration of Gibson's Centennial Anniversary. 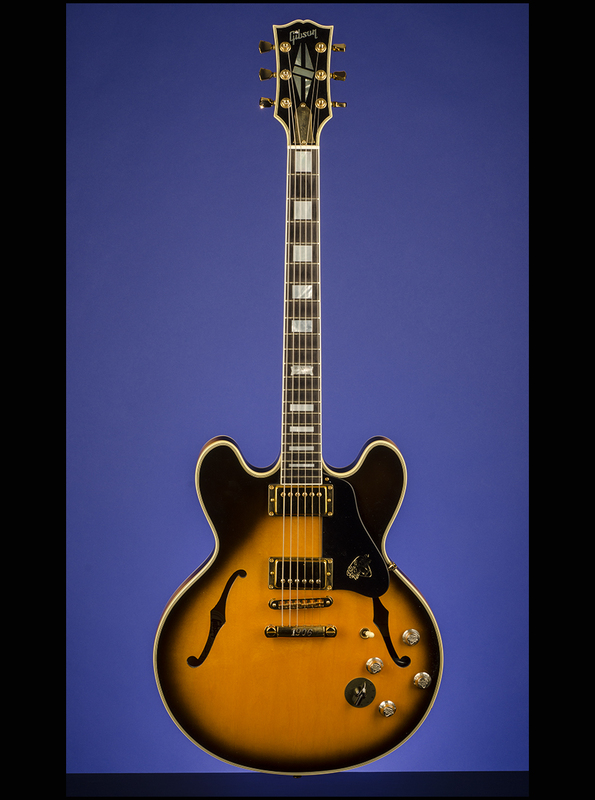 Included in this collection were such iconic guitars as the famous ES-355, ES-350T, Flying V, 1057 Black Beauty and history-making Les Paul Standard. Valuable in their historical significance alone, these guitars featured jeweled appointments never before availabale on any electric guitar*. These special appointments & features included: 11 pt. 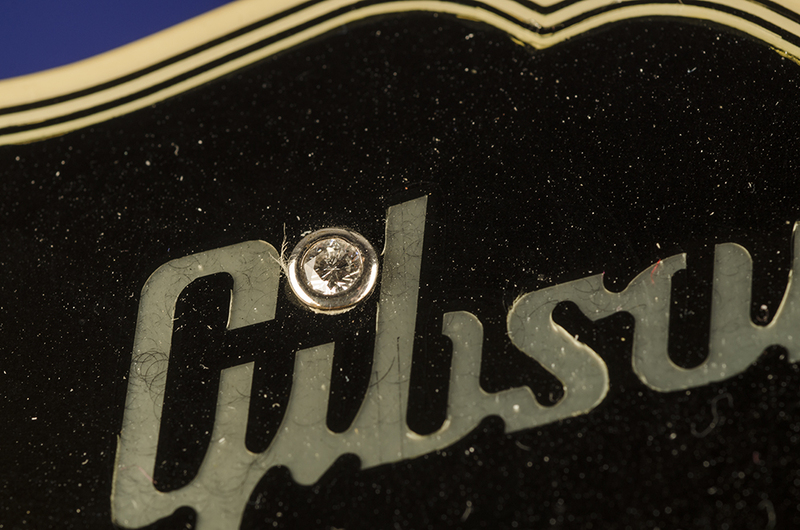 Diamond on the Gibson headstock logo.5 Pt. Diamond detends on the 22K gold plated top hat knobs.Diamond jeweled sterling silver Centennial serial number (1894-1994). Gold plated top hat knobs with 100 Year Anniversary logo. Mother of Pearl inlays including 12th fret, 100th Anniversary banner 22K gold plated anniversary Orville Gibson coin embedded on the back of the headstock. Centennial headstock cover with the 100th Anniversary logo. Gibson offered some unique concepts with this Collection. The top hat knobs are solid silver which are gold-plated prior to the setting of the diamonds. All the diamonds are grated by a certified gemologist prior to being mounted on the guitars. 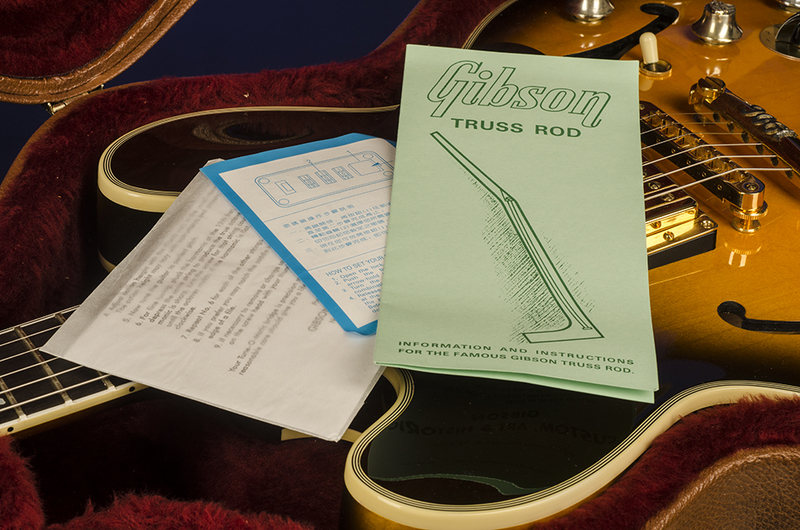 Each of these appointments are designed to enhance history making Gibson instruments.